Yesterday’s new Fallout 76 patch added a new mode called Survival, which is currently in beta. It’s separate from the main game, which has now been retitled Adventure, though players can still explore it using existing characters—which they’ll definitely want to do if they don’t want to get torn to shreds. I made this exact mistake when I created a character from scratch to try and explore Survival as a freshly-minted level 1 vault-dweller. At first, everything was fine. The sun was shining and I was excited to see Appalachia through a new, more merciless lens. A few minutes later I was jogging down the road when I heard gunshots. A notification then popped up on my screen informing me that two players had just died at the hands of a third. Moments later I was blown up by a level 146 player in a Fasnacht owl mask. The biggest thing that sets Survival apart is that it doesn’t have any rules of engagement. Players can deal damage to one another at all times, unlike in what is now called Adventure mode, where no one gets hurt until they start fighting back. But that’s just the tip of the blood-soaked iceberg. Players can holster their weapons when approaching one another in order to have their names appear over their heads, or keep them drawn to show they’re hostile. And though the dangers potentially lurking around every corner might incentivize people to team up, they’ll get extra rewards for killing one another, including double the normal bottle cap rewards and the chance to loot their opponent’s corpse for health items and crafting materials. There are a lot of global changes that make Survival feel like a very different game as well. A leaderboard shows the cumulative stats of everyone currently on the server, including how many people they’ve killed and how long it’s been since they last died. Also, unlike in Adventure mode where every player appears visible on the map, in Survival only the players with bounties placed on their heads and the top three longest-surviving ones will be visible. Everyone else will be hidden, making it that much more dangerous to venture out into the world. When people do die, they’re only able to spawn at Vault 76, their campsite, or train stations. This means that death is more costly, and also that players can’t easily hunt one another down by fast-traveling to every major location. While it makes sense on the surface, rules like this have other consequences that help show why balancing a PVP-oriented mode can be so difficult. For example, since players can only use train stations to fast-travel, they make excellent sites for camping (and not the kind of camping that involves tents and toasted marshmallows). I found this out the hard way. After donning my Power Armor, repairing my minigun, and downing a bottle of Vintage Nukashine to double my damage output, I fast-traveled to the Whitespring station to go hunting. When I spawned, even before my screen had fully loaded, I was shot down by three other players, each with their assault rifle trained on me. 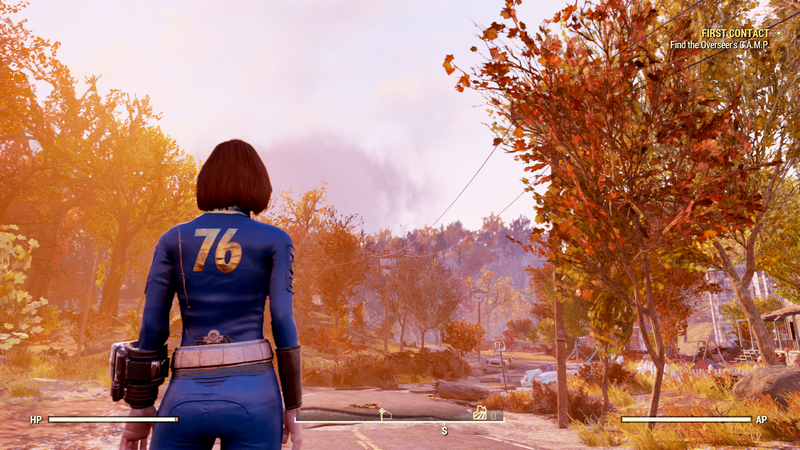 In the few hours I’ve played Survival so far, the average player level I’ve come across is in the low 100s, making it incredibly inhospitable for anyone who has spent only a few dozen hours with Fallout 76. Bethesda has tried to curb that slightly by reducing weapon damage in Survival to help prevent people from being one-shotted, but the current balance still doesn’t prevent most people from being dog meat. As a result, some players on the game’s subreddit have already jokingly taken to calling for Survival to be renamed Deathmatch. Other players have suggested that Bethesda add a third mode that’s like Survival but without the leaderboards and which would require everyone to make new characters locked to that mode. While the increased tension of anyone being able to attack anyone at any time for any reason does offer a lot of options for interesting role-play, as it currently stands, Survival is basically just a playground for the most invested players to inflict the results of their hundreds of hours of grinding on everyone else. Bethesda seems to be aware of the asymmetries it’s courted with Survival. In an overview of the mode posted on its website it points out that players will earn 20 percent bonus experience for everything they do while playing in Survival. “This should help your new characters get into fighting shape more quickly and give your seasoned characters more frequent level-ups as you conquer Appalachia,” it wrote. It’s a nice idea, but good luck catching up to a level 146 player that way, especially when they’re actively hunting you.